Excellent article as usual, Rodger. I would also like to add that the example of creating and spending dollars is the most archetypal example of things that a Monetarily Sovereign government does much better than the private sector. Private banks create out of thin air and lend money into existence all the time. But unlike when the federal government does it, due to the profit motive, there are *always* strings attached: not only must it be paid back in full in a timely fashion, but while they create the principal, they do not create the interest that must also be paid pack as well. For example, if they lend you $100 at 5% interest, then you must pay them back $105, and that extra $5 must come from somewhere (i.e. from existing dollars in circulation, or then lend even more into existence with even more interest). Thus, absent any federal deficit spending (or worse, a surplus), there is NEVER enough money to pay it all back, creating an artificial scarcity of dollars in the economy. This is precisely what happened when what should have been the mild recession of 1929 was turned into the Great Depression–federal budget surpluses combined with debt deflation combined with stubbornly high interest rates (to prop up the failing Gold Standard) combined with banks refusing to lend any further while still demanding payback of existing outstanding loans. It sure was not pretty. 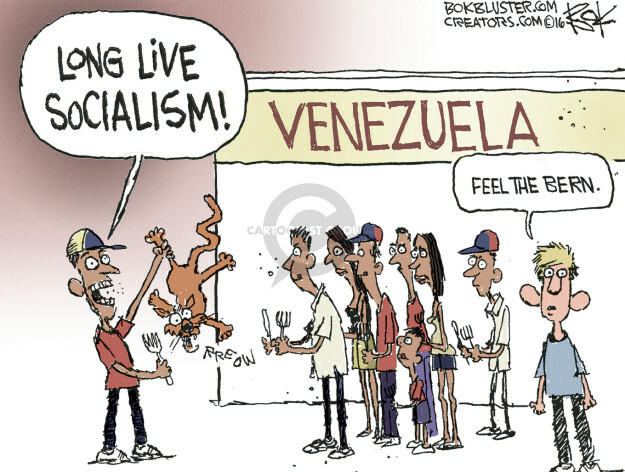 “It isn’t socialism that has injured Russia and Venezuela; it’s criminal dictatorships — closer to Donald Trump’s administration of criminals than to real socialism.”……….. Maduro is not a dictator. Chavez was not a dictator. Both were elected with a plurality of the vote. Get your facts straight. Venezuela is failing, primarily, because of the actions of the US (sanctions, blackouts, etc.) and the falling price of oil (the US again). If you get your “facts” from the US media system you are woefully ignorant of what the people of Venezuela are saying, and they are not in favor of Guaido, a hack of the neoliberal wing who will assist in stripping the Venezuelans of their natural resources, and the gains that have been achieved under Chavismo. Thank you for your comments. Many dictators have been elected. Arresting opposition leaders is one symptom of the Venezuelan dictatorship. Given its oil wealth, even falling prices should not have caused their economic problems but for scarcities caused by crooked government. All hyperinflations are caused by scarcities. After all, Saudi Arabia and the U.S. are major oil producers, and they have not had Venezualan’s problems. So US sanctions weren’t designed to cause shortages? You don’t think that people organising terrorist acts like burning journalists alive should be gaoled apparently. Venezuela’s “criminal dictatorship’? That silly allegation devalied anything else you may have said. When criticising a flase narrative it’s best to stick to facts.